Nick has his A-game on (like always!) and has beaten me to the post, already writing about post-nationals training (check it out below). Backtracking a bit here’s a quick outline of nationals and how everyone in the team did. 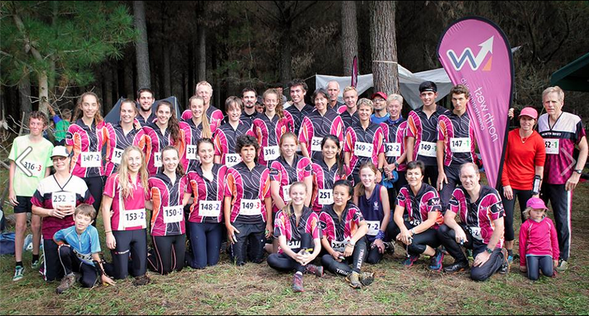 Firstly, thanks to Wellington Orienteering Club for putting on some great events on some quality maps! Secondly, especially thank you to North West Orienteering, who have always been incredibly supportive despite me living at the opposite end of the Island. JWOC team members Kayla, Alice, Cam and Becky with North West Orienteering, best club out. I was pretty excited to have the chance to run at Ohakea Airforce Base. Not letting me down, I found it a fast, flat but solid course. More than anything, this race showed that this years JWOC team is full of strong sprinters. In the girls, Alice nailed her run and would have placed 4th in W21E. Sonia (had she not been running up in 21E) and Kayla also placed on the podium. What these girls don’t have yet in experience, they make up for in fantastic form and that has got to be an exciting mix?! Vida and Helena were next. Especially important to mention the solidity of Helena’s run given she’s been sick since trials. Can’t wait to see that girl race when she is fully recovered. The boys definitely proved a point with Tim, Nick and Shamus all placing in men’s elite. Devon’s fantastic run in M20 took the lead, with Callum, Ed and Matt behind. Going by splits, Cam is capable of and does run at an equally impressive level. This just shows that the strength in New Zealand junior orienteering at the moment totally extends beyond those in this team. It’s the depth of all junior elite classes that keeps the ball rolling and everyone on their toes. In W20 Sonia and Kayla had an extremely tight race, again showing good technical form. Helena again demonstrated a clean, clear run. Alice displayed good control, especially at the beginning of her run. Tim should be over the moon to have won M21E, with Nick in second and Shamus not far behind in fifth place. Awesome effort. In M20 Cam should be equally as stoked, winning by three minutes. Matt Goodall ran into second and Ed showed consistency with third. In the girls, the quick, clean running of the long especially suited Kayla who ran into first place by 10 minutes. Alice was second, followed by Sonia. Personally, from this race I had an important reminder of how important it is to read your map and use your compass. Big, big mistakes take a while to fix. For the boys in particular, the long this year was especially long. Tim finished off a podium filled weekend in third place in M21E, with Nick close behind! From what the boys said, the terrain gave way to a few mistakes in M20 but Callum came out first, with Ed and another good run by Devon. Cam and Matt were extremely close behind. I really liked the relay this year, with the fast terrain keeping it quick. All the JWOC team members had fantastic races, which echoed the whole weekend.